Globe SP30 Planetary Floor Mixer, 30 qt. Home / Food Prep / Commercial Mixers / Stand Mixers / Globe SP30 Planetary Floor Mixer, 30 qt. The perfect mix of value, performance and durability! The heavy-duty gear driven transmissions easily mix all kinds of products, and front-facing controls allow you to track your batch from across the kitchen. 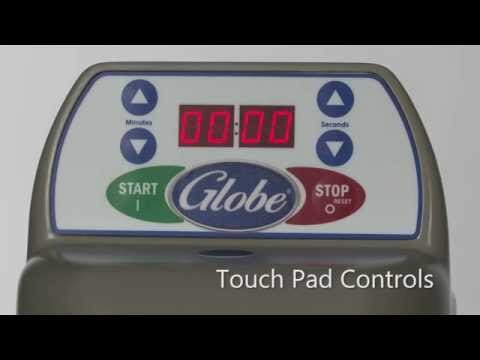 Globe's SP30 is made to hold up to 30 quarts per mixing batch. This mixer features front mounted controls, 3 speeds and a 60 minute timer for accuracy and easy control. Mixer includes a stainless steel bowl with a built-in ingredient chute that is easily removable using the interlocking bowl lift. The body of this mixer is constructed with cast iron and is painted with an enamel gray. The mixer also includes non-slip rubber feet for stability and a stainless steel wire whip, an aluminum dough hook, and an aluminum flat beater with a #12 hub attachment. This product measures at 50.75 inches high by 23.25 inches wide by 24.5 inches deep. Interlocked bowl lift, NSF, cETLus, 16 Amps, 1 HP, 115v/60/1, NEMA 5-20P, 6 foot cord.